Today I’d like to share a nerd thought experiment with you people, and since many of you are already deeply nerdy, pardon me if you’ve already thought about it. Feel free – no really, I encourage you – to argue strenuously with me if I’ve misrepresented the current thinking on this. That’s why I have comments!! It’s called the Fermi Paradox, and it’s loosely speaking a formula that relates the probability of intelligent life somewhere besides here on earth, the probability of other earth-like planets, and the fact that we haven’t been contacted by our alien neighbors. It starts with that last thing. We haven’t been contacted by aliens, so what gives? Is it because life-sustaining planets are super rare? Or is it because they are plentiful and life, or at least intelligent life, or at least intelligent life with advanced technology, just doesn’t happen on them? Or does life happen on them but once they get intelligent they immediately kill each other with atomic weapons? So the bad news (hat tip Suresh Naidu) is that, due to scientists discovering more earth-like planets recently, we’re probably all going to die soon. Here’s the reasoning. Notice in the above equation that N is the product of a bunch of things. If N doesn’t change but our estimate of one of those terms goes up or down, then the other terms have to go down or up to compensate. And since finding a bunch of earth-like planets increases some combination of R*, fp, and ne, we need to compensate with some combination of the other terms. But if you look at them the most obvious choice is L, the length of time civilizations release detectable signals into space. And I say “most obvious” because it makes the thought experiment more fun that way. Also we exist as proof that some planets do develop intelligent life with the technology to send out signals into space but we have no idea how long we’ll last. Anyhoo, not sure if there are actionable items here except for maybe deciding to stop looking for earth-like planets, or deciding to stop emitting signals to other planets so we can claim other aliens didn’t obliterate themselves, they were simply “too busy” to call us (we need another term which represents the probability of the invention of Candy Crush Saga!!!). Or maybe they took a look from afar and saw reality TV and decided we weren’t ready, a kind of updated Star Trek first contact kind of theory. 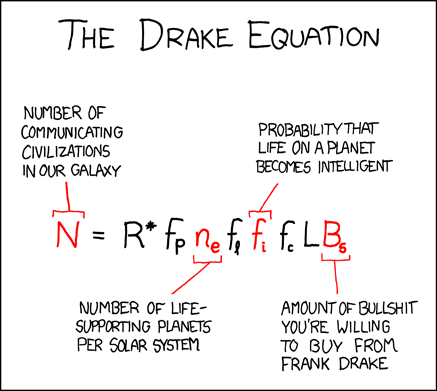 There is nothing I hate more than the damn Drake equation and I am happy to see you make fun of it. To me the Drake equation is to astronomy what parapsychology is to psychology. I also remember someone at Foo Camp (Frank WIlczek?) saying that a really advanced civilization, on Earth or elsewhere, would probably realize that being “visible” to aliens is a Bad Idea, and would take steps to make sure that they weren’t. Hey, Frank’s got a Nobel and I don’t, so who am I to argue? So L may be as low as 200 or 300, even without an apocalypse. Even if it’s 1000 or 10,000, it’s way to small on an age-of-the-Universe time scale. Though I have to say that, if we don’t get energy consumption under control, an apocalypse is more than likely. I’m pretty sure f_i is small enough to make N < 1 even if the other terms assume their maximum theoretical values. Or perhaps the most likely option is that they simply want to hide their existence from us. Maybe the Prime Directive is a Thing. First, just a minor quibble with a previous commentator. Not all RF below the VHF band is absorbed or refracted by the ionosphere. Some gets through and it’s not a sharply defined cutoff. Second, how do we know that a civilization that stops sending RF out into the universe is destroying itself? They may just be moving on to other things, such as lasers and optical fibers. We appear to be doing that ourselves to a large extent. 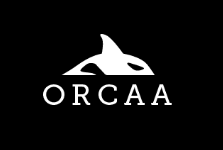 We only have a single sample of how a civilization of sentient organisms acts and it seems to me rather shaky to generalize behaviour from a single sample. I think the proper conclusion to draw at this point is that there is “not enough data for a meaningful conclusion”. I agree this equation is fanciful, thus I propose it needs terms for civilizations that make contact with off-world civilizations, civilizations that conquer other off-world civilizations, and civilizations that live in harmony with other off-world civilizations. Chuckle. Wow! this is so bizarre!… just in the last 24 hrs. I was telling someone how ridiculous I thought both the Fermi Paradox and the Drake Equation were — I’ve never understood how professional physicists could even spend serious time on them. Both involve too many assumptions and unknowables, resulting in the first being overly pessimistic and the second being overly optimistic (and both being overly simplistic!). I think this conversation is going around like a cold. It’s because of all the cool physics going on. We lame non physicists want a piece of the action. Actually I will speak for myself. I am a lame non physicist. You might be something else! What the Drake equation misses is time. There is a short window in our history in which we radiate anything that any other civilization would be able to see. Maybe in the future we will be able to produce so much energy that light from our planet will become a signal but for the radio waves we had a short burst of energy radiating and then it will die off. Now what are the probabilities that our signal crosses a civilization that has technology that allows them to listen and they are. A few centuries off and they miss us and likewise we probably them. We may have been able to view alien I Love Lucy shows during the Middle Ages if only someone would have invented television by then. But now it’s gone and now we look. The concept of the exact moment in time is missing from that equation and I believe that it drops the probabilities dramatically. Referring to the xkcd version of the Drake Equation, I suspect that B and f_i are inversely proportional. Just a warning to your readers. Fc may also be nearly zero. Over interstellar distances, radio communications become extremely weak. There are so many silly assumptions in the Drake equation. It assumes that we would recognize an intelligent species if we saw it (If a mushroom or moss was intelligent, how would we know? ), that any intelligence would use technology in the way we would, that 2nd order sentients (aritificial intelligences) that would have any interest in contacting more primitive naturally occuring intelligences whose primary motivations were still food, fight, flight and uh, reproduction. Everyone has missed Arthur C Clarke’s hypothesis about why we haven’t seen any aliens — the distance is too great and to go that far they would probably need a quite good reason to do so. He assumed that the limiting velocity of light was not overcome in any way. He didn’t see any good reason for there not being intelligent life somewhere in the universe but saw no good reason for why they would come here to what is really an outpost, in the astronomical scheme of things. In that case, radio signals at the minute, day or hour scale that we use when we listen using SETI are quite likely to be random, In the same way that our radio signals sampled at a nanosecond interval don’t really make sense. I don’t really have an issue with the Drake Equation itself, but I find it interesting that people seem to develop amnesia as soon as they start putting actual numbers in there. All the inputs are estimate. As a result, N is an estimate as well. 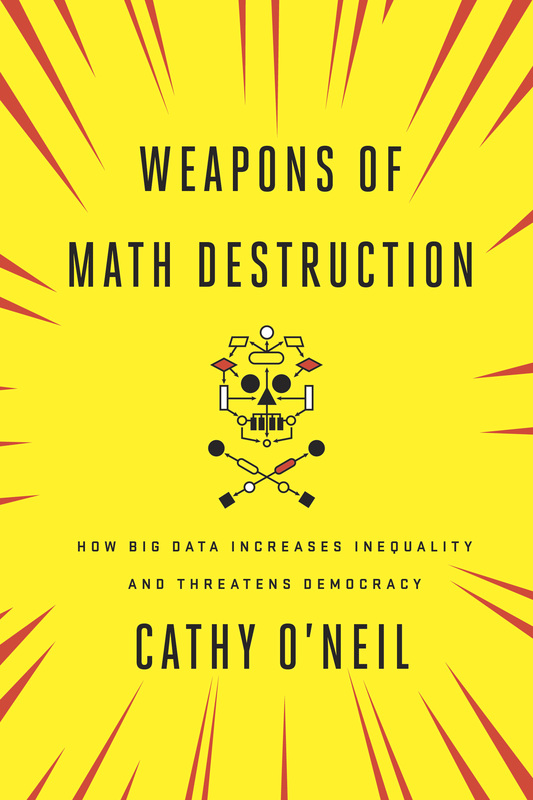 It doesn’t require higher math to compute the standard deviation of that estimated N if you know the st.devs of all the inputs (and are willing to assume the inputs are independent). The results are a lot of fun. For fairly acceptable values of the inputs it’s easy to get an estimated N of 1, with a st.dev. of 12. The second point is that the galaxy is a bit place. If N is indeed, say, 10, then each of those civilizations has a gigantic number of stars to themselves, and if you are again willing to assume a uniform distribution over the galaxy (stupid, but more realistic assumptions can ne worked out as well) you end up with impressive distances between those 10 civs. They’re out there, theyre just 1000s of lightyears away and we’re a needle in a haystack of millions of stars.